We propose new constructions for inner product encryption – Open image in new window and Open image in new window , both secure under the eXternal Diffie-Hellman assumption (SXDH) in asymmetric pairing groups. The first scheme has constant-size ciphertexts whereas the second one is weakly attribute hiding. Open image in new window is derived from the identity-based encryption scheme of Jutla Roy (Asiacrypt 2013), that was extended from tag-based quasi-adaptive non-interactive zero-knowledge (QA-NIZK) proofs for linear subspaces of vector spaces over bilinear groups. The verifier common reference string (CRS) in these tag-based systems are split into two parts, that are combined during verification. We consider an alternate form of the tag-based QA-NIZK proof with a single verifier CRS that already includes a tag, different from the one defining the language. The verification succeeds as long as the two tags are unequal. Essentially, we embed a two-equation revocation mechanism in the verification. The new QA-NIZK proof system leads to Open image in new window , a constant-sized ciphertext IPE scheme with very short ciphertexts. Both the IPE schemes are obtained by applying the n-equation revocation technique of Attrapadung and Libert (PKC 2010) to the corresponding identity based encryption schemes and proved secure under SXDH assumption. 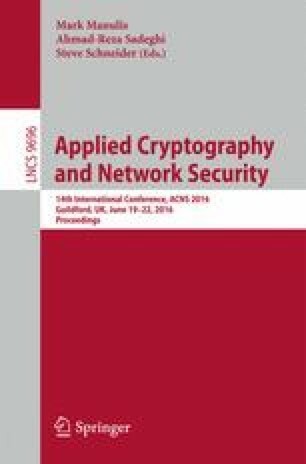 As an application, we show how our schemes can be specialised to obtain the first fully secure identity-based broadcast encryption based on SXDH with a trade-off among the public parameters, ciphertext and key sizes, all of them being sub-linear in the maximum number of recipients of a broadcast. I would like to thank Benoit Libert and Palash Sarkar for helpful discussions as well as the reviewers of ACNS’16 for their valuable comments. This research was funded by the “Programme Avenir Lyon Saint-Etienne de l’Universite de Lyon” in the framework of the programme “Investissements d’Avenir” (ANR-11-IDEX-0007).